Yo, Rob! If that gig as mayor doesn’t work out, and let’s be real, the possibility of your rather large derriere continuing to occupy Toronto’s mayoral desk chair seems remote at best just now, I hear the Dolphins might have some needs on the offensive line. Separated at birth or merely hatched by the same devil spawn? Call me crazy, but it looks like a match made in heaven as far as I can tell. Of course the NFL does require drug testing, but nobody in Miami seems to be too worried about employing utterly unhinged, foul-mouthed, hyper-aggressive, ranting rage balls. So if you can kick that little crack habit, Mr. Mayor, I think you’ll be golden. And really, in terms of climate, you’d be way ahead of the game. And by the way, Richie, Torontonians seem to like a large side of crazy with their governance — you know, in the event football is no longer an option. Just sayin’. And you thought the Weiner/Spitzer situation was out of hand. 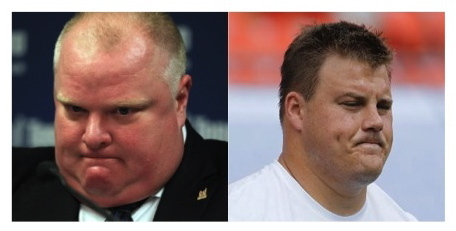 Posted on November 8, 2013, in Commentary, Weird Weird Weird and tagged Dolphins, NFL, Richie Incognito, Rob Ford, Separated at birth, Toronto. Bookmark the permalink. 11 Comments. Just wanted to wish you and yours a Happy Turkey Day. Eat, Drink, and Live Well!! Right Back at you, Jed! Here’s to gluttonous excess. And lets not forget dear Mayor Marion Barry, the crack smoking mayor of our fine capital who was reelected. My poor poor city. How about we send him to Miami and don’t ask for anything in exchange? Oh no, I think you’d have to take something. How about a big barge of garbage? As a Canadian, I’m embarrassed that a guy like Ford was elected. It doesn’t reflect well on us…no…. We elected a professional wrestler as governor of Minnesota, and then there was the Governator…don’t worry. Smoking crack in a drunken stupor? How many times did I tell him, pot with booze, downers with crack. Christ won’t they ever learn?